Mission Bay is a waterfront haven for all Aucklanders. Built around the idyllic, pohutukawa-lined beach and separated from the central city by a brief and beautiful drive, it’s no wonder that Mission Bay is celebrated destination for locals and visitors alike. No matter what the weather, Mission Bay welcomes everyone with open arms and a variety of experiences. Enjoy the parks, get active (by land and by sea) or simply relax and explore the surrounds. From the iconic fountain to dining with views of Rangitoto and the Waitemata Harbour, it truly is the bustling, vibrant heart of Auckland’s Eastern Bays. We like to keep you in the loop. Most of our businesses are open each day over the Easter and Anzac Day break. Click here for business trading hours in Mission Bay. Dine along The Promenade and enjoy spectacular views of Rangitoto and the beautiful Auckland Harbour. 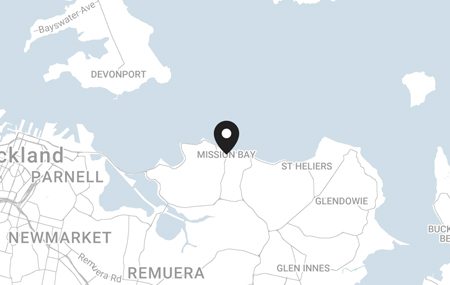 Mission Bay is home to a range of international flavours and a great mix of local favourites. Stop by or check out our Places to Go online. Mission Bay is one of the best places in Auckland to visit as it has so many things for you to do! Whether you want to eat, drink, play, swim or shop, you’ll find something at Mission Bay. The Berkeley Cinema combines classic Art Deco style with the latest cinema technology, comfortable seats and a great wine list! Enjoy new release movies in a four screen cinema complex with tickets only $13, at all times, for all ages. The Trevor Davis Memorial Fountain is one of the area's landmarks. Situated on Selwyn Reserve, the fountain has been a source of beauty, fun and interest since 1950. Recently restored, thanks to the Orakei Local Board, a control panel next to the fountain takes you through a verbal account of Mission Bay's history. Wondering what the weather's going to do today? Check it out by clicking the link below. Rain or shine, there's always something to do in Mission Bay. The short trip from central Auckland to Mission Bay is not only picturesque, but dotted with some of Auckland's other favourite attractions. The Auckland Museum contains fascinating memories of Auckland's and New Zealand's history. The Promenade has two customer carparks offering 93 parking spaces located off Patteson Ave on the left and right hand sides. Simply purchase your ticket from the Pay and Display machine, display the upper portion on your dash and take the lower portion with you. Present the bottom part of the docket when paying and the Promenade operator will deduct the amount from your bill.